Martin Competes in Isoman Triathlon! My wife Julia and I did the Isoman Triathlon on the weekend. It is an event that places equal emphasis on each of the three disciplines and therefore increases the swim and decreases the cycling. Perfect for me really as I am a strong swimmer and cycle like a piece of concrete. 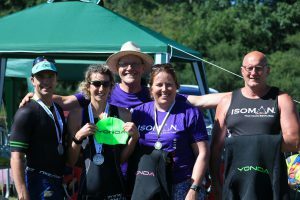 I broke a cardinal rule by racing in new kit, debuting a new wetsuit from ‘Yonda’, a local Yorkshire outfit with high quality products at decent prices. I managed to win the 5.6km swim leg, closely followed by Julia. The run was brutal! A half marathon through the hottest part of the day. It was all about heat management and rehydration. Perhaps I picked up some experience of this at the London Marathon earlier this year (another pattern developing here…) Basically I had to just grind out the distance with stubbornness and mental strength. In the last quarter I gave up the lead to a better athlete. I was thrilled to finish second in the Isoman Half category (3.5mile swim, 30.6mile bike and 13.1mile run). Julia won the ladies division and finished 3rd overall, a breathtaking achievement. She dug deep for that victory and paid a visit to the first aid tent after the finish, wracked with cramps. Such was the toll of the heat. We were joined by three friends who participated in the swim categories. These true heroes finished their races and unselfishly enjoyed the sun, with a few drinks, whilst supporting Julia and I. True friends! Thanks to Gary and team at the Isoman for a fabulous event. Special mention to the marshalls and first aiders who were magnificent. Particular thanks to Pauline for her marathon effort looking after Kaia in our absence. Lastly, thanks to Emma, Stephen and Nick for a thoroughly entertaining weekend!